Boom Trucks (Bucket Trucks) Market size is set to exceed USD 1.5 billion by 2024; according to a new research report by Global Market Insights, Inc.
Increasing infrastructure investments coupled with the growing construction sector is anticipated to drive the bucket trucks market over the forecast timeline. Several countries in Asia Pacific, Europe, and the Middle East are undertaking large-scale projects to refurbish the existing infrastructure. Bucket trucks facilitate easy lifting of people at heights, where ladders cannot be utilized. Population growth, environmental impacts, and urbanization have driven the need for smart and sustainable infrastructure solutions. Countries including India and China are preferring reliable lifting equipment over the traditional construction techniques to ensure operator safety. Major construction projects such as Al Maktoum Airport, Dubai; Beijing Airport, China, and the industrial city project Jubail II in Saudi Arabia will propel the boom trucks market growth. Increasing demand for leasing and used equipment is anticipated to limit the bucket truck market growth over the forecast timeline. In addition, rising cost associated with the maintenance and upkeep of this equipment is posing a major challenge to the end users. The maintenance of bucket trucks is a complex task that involves a lot of steps such as checking the engine, transmission, power steering, the condition of belts, maintenance of tires, checking of wheels and rims for damage, and battery conditions. OSHA and ANSI regulations require that the machine must undergo regular inspections to ensure that it offers optimum performance thereby ensuring operator safety. Insulated bucket trucks are gaining importance owing to their applications in the utility sector. Many regions are witnessing increasing government initiatives to upgrade their existing power grids. These initiatives to upgrade are a result of the increasing demand for high-quality reliable power. The expanding power grid structure has led to a rise in the demand for the utilization of these trucks in upgrading power grids. These trucks are the most sophisticated machines to safely convey linemen to large heights where they are expected to work to improve, maintain, and manage electric power distribution and telecommunication network. Rising demand for these trucks from the utility and power sector will provide significant growth opportunities to the bucket trucks market growth. The bucket trucks market is expected to experience growth owing to the rising demand from the telecommunication sector. Several countries are focusing on increasing investments to enhance and refurbish their existing telecom infrastructure. Growing penetration of telecom companies in emerging economies and their efforts to expand the network are further boosting the demand for the boom trucks market. The sturdy structure of these trucks and the wide variety of designs available make the trucks a convenient option for applications in the telecommunication sector. Increasing penetration of smartphones across various regions coupled with the need for enhanced telecom infrastructure for improved connectivity is expected to propel the bucket trucks market growth. 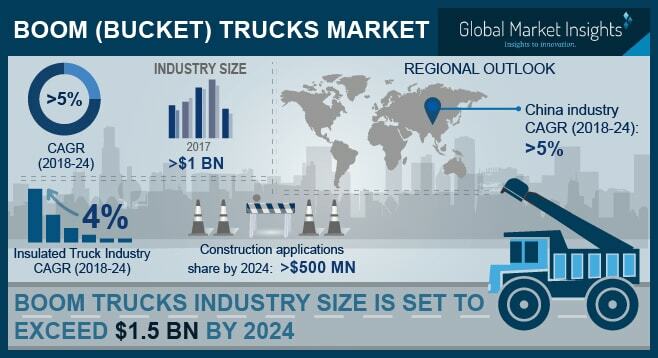 UK bucket trucks market is anticipated to witness growth owing to the booming construction sector in the region. The presence of major rental companies such as Riwal, Kiloutou, and Haulotte Group will aid the industry growth in the country. With the construction sector focusing on replacing traditional construction techniques with modern advanced machinery, the bucket trucks market is anticipated to witness a substantial growth. In addition, the industry will flourish in the UK due to the demand from the utility and telecom sectors. However, geopolitical uncertainties, continued slowdown in the international trade, and the impact of the UK’s announcement to leave the European Union may create market risks for several companies. Key players operating in the bucket trucks market include Aichi Corporation, Axion Lift, Manitex International Inc., Versalift, Terex Corporation, Palfinger AG, Socage S.R.L, Altec Corporation and CTE Group. Companies are trying to expand their regional presence by acquiring smaller companies and expanding their product portfolio. Stringent regulations pertaining to operator safety are compelling manufacturers in the bucket trucks market to enhance their product portfolio by incorporating advanced safety measures.